Residents like trying new dishes but nothing too spicy. 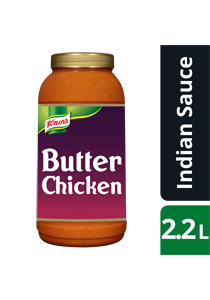 KNORR Patak’s Butter Chicken Sauce offers a mild, delicious curry residents will love. The perfect MILD CURRY that keeps them satisfied. KNORR Patak's Butter Chicken is a rich, sweet, butter flavoured simmer sauce. Due to authentic nature of this product, some oil separation may occur. We recommend that you store it well before usage. Volume 2.2 L. Volume per serving/portion 100 ml. Sauces are easy to use as no preparation is required and no ingredients to add. Saves time and provides good cost and portion control. Consistent quality and taste every time. Perfect for low skilled kitchens for Chefs who don't have time to cook from scratch. Also ideal for Chefs who want to add their own creativity. Once opened, keep refrigerated and use within 3 days, or freeze remaining contents immediately. Defrost in the refrigerator and use within 24 hours.